In March 2017, the FDA issued a warning confirming that breast implants cause BIA-ALCL cancer which is a cancer of the immune system however the history of breast implants causing breast implant associated lymphoma cancer and other cancers goes much farther back. The first case of lymphoma due to breast implants was reported in 1997, and now as of February 8, 2019, there are 688 confirmed cases and 16 known deaths. The actual number of cases of BIA-ALCL is likely to be much higher because identification of and testing for BIA-ALCL is hardly known by doctors and surgeons and so not available to most women with breast implants and symptoms. Despite the mounting cases of BIA-ALCL and other cancers occurring from breast implants and being reported on an ongoing basis, manufacturers submitted to the FDA and the FDA approved more textured implants for sale as late as September, 2016, knowing that these textured implants are particularly linked and responsible for BIA-ALCL. In fact, the incidence rate for BIA-ALCL for Allergan textured implants (old and new) is approximately 1 in 4,000 from US and Australian studies. Health Canada and the FDA are failing in their duty to the public by failing to ensure full disclosure and warnings are placed on breast implants regarding the illness, autoimmune diseases and cancers they cause. It should be no surprise that silicone and breast implants cause cancer and profound health problems as silicone is made with several carcinogenic and highly inflammatory chemicals however that too is hidden from the public by the manufacturers of silicone and the manufactures of breast implants and also by Health Canada and the FDA who approve and govern the sales of breast implants in North America. If you have textured implants and symptoms of BIA-ALCL you need to push for testing. 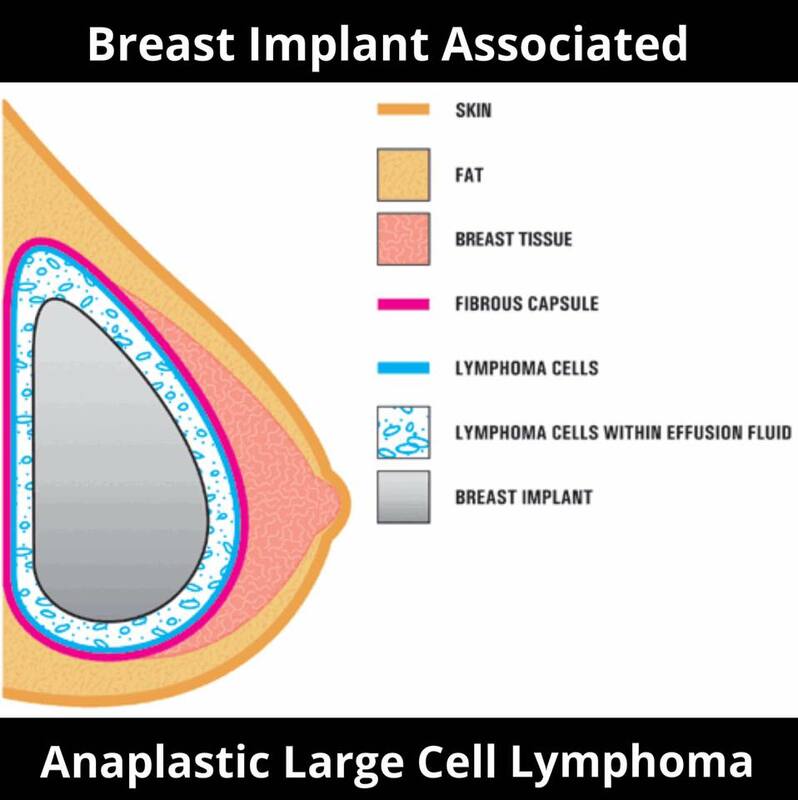 BIA-ALCL BREAST IMPLANT ASSOCIATED LYMPHOMA is a type of non-Hodgkin’s lymphoma, a cancer of the cells of the immune system (not breast cancer) that can be caused by breast implants. 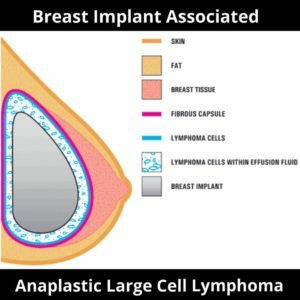 The main symptoms of BIA-ALCL are persistent swelling or pain in the vicinity of the breast implant, seroma, breast mass, capsular contracture, swollen lymph nodes and are associated with textured implants. These symptoms may appear after the implant surgical incision has healed and often can appear years after implant placement. If you have swelling, pain, seroma, breast mass, capsular contracture or swollen lymph nodes and especially if you have textured implants please push hard for BIA-ALCL testing. Surgeons should consider the possibility of ALCL when they have a patient with late onset, persistent fluid around the implant (peri-implant seroma) before and or during explant or exhibit the symptoms after explant. When testing for ALCL at the time of explant, surgeons should collect fresh seroma fluid and representative portions of the capsule and send for pathology tests. The test is called CD-30 Immunochemistry and few plastic surgeons are knowledgeable about BIA-ALCL at this point so it will be up to you to educate your plastic surgeon and persist in getting the test if you have any symptoms and/or textured implants. Here is the American Society of Plastic Surgeons’ current information on BIA-ALCL: https://www.plasticsurgery.org/for-medical-professionals/quality-and-registries/bia-alcl-frequently-asked-questions.